These complaints are nothing new, we heard the same gripes thru the years with Windows 3.1, 95, XP, Vista, and Windows 7! If you look at it from Microsoft’s point of view you will find that advancements in hardware drive changes in the operating system. The changes in Windows 8 are driven by the fact that computing devices are getting smaller and they are also moving toward touchscreens. On a small touchscreen every pixel of space on the screen is precious. You can’t cover it up with buttons and menus that are only needed once in a while. And, in order to use a fat finger to select a command, that command needs to be fairly large. So, you don’t want to take up space unnecessarily, and, when you do, it has to be big. How can this possibly be accomplished? By making menus disappear until you ask for them, and then make them big. There is a lot to learn with the new operating system, Windows 8. In this article we’re giving you 5 tips that we think will go a long way to ease your frustration. 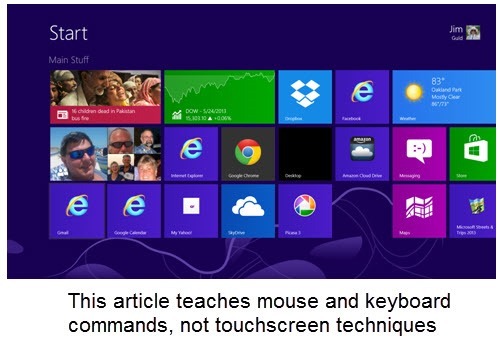 We are not dealing with touchscreens in this article, we are writing for mouse and keyboard users. When you buy a new PC laptop these days, it will come with Windows 8 whether you want it or not! Small, touchscreens may have driven the changes, but Microsoft wants their operating system to work the same on all devices, large and small. A big complaint about Windows 8 is that the Start menu is gone. Actually it’s not – it has just changed into a Start Screen. Every menu option is now a Tile on a screen devoted completely to your start menu. When you’re not on the Start Screen, you can get there by moving your mouse to the lower left and clicking on the icon of the Start Screen that appears. Think about it, this is exactly what you did with all previous versions of Windows since 95 … move your mouse to the lower left and click … to bring up the Start menu. Or, if you prefer keyboard, just use the Windows Logo Key. If you’re not looking at the Start Screen, pressing the Windows Logo key will show you the Start Screen. If you are looking at the Start Screen, the Windows Logo key will hide it, taking you back to whatever you were looking at before. It’s a toggle. Turn the Start Screen On / Turn the Start Screen Off. You are never more than one click or one keystroke away from the Start Screen. If you spend some time customizing the Start Screen so that everything you use regularly is right there, we think you will start to love it. The Start screen is more than first meets the eye. You can scroll to the right to see more Start Screen Tiles. A horizontal scroll bar will appear when you move your mouse to the bottom of the screen, or you can use the scroll wheel on your mouse. If one of your often-used programs is off to the right, you can drag it from its position to somewhere on the first screen. To add a different app: If you have a program (App) on your computer, but not on your Start screen, find the program in your All Apps (or Search for it – see below), right click it, and choose “Pin to Start Screen.” It will probably be put at the very right end of your Start screens, so you then need to drag it to where you want it. Create a Tile from a Desktop icon: If you have an icon on your desktop for anything, you can right-click and choose Pin to Start. Now it’s a tile at the right end of your Start Screen and you can move it to your desired location. If you’ve followed Tip 1, and you’re looking at your Start Screen but you don’t see what you want, just start typing. Whatever you type will be interpreted as a Search. So, if you want to use Excel and you don’t see a Tile for it, just type Excel and it will be found for you. The hardest part about this is how easy it actually is. You can search for an application, a document, a picture, or even a computer setting. Let’s say you want to change the background of your Start Screen but you don’t know how. Make sure you’re looking at your Start Screen. If you’re not, just click in the lower left, or press the Windows Logo key. Type Background. It will search for the word “Background” and show you the results by displaying the number of Apps that match the word, the number of files that match, and the number of settings that match. Click where it says Settings, and you’ll see the details appear and you can click on the Background setting. The Start menu isn’t the only menu that seems to be missing in Windows 8. The new, built-for-Windows-8 programs, are referred to as Full-Screen Apps. That means that they do not use up screen space for their menus when you don’t need them. How does it know you need them? Right-Click anywhere on the screen and whatever menus are available for that Full Screen App will appear. Remember that the goal is to leave menus hidden until you need them. Hot corners are sort of like the triggers for secret passageways. Click the right spot and menus appear! In Windows 8, those secret trigger spots are at the edges of your screen, usually a corner. You’ve already learned about the lower left corner for the Start Screen Toggle, and that the keyboard option is to press the Windows Logo key. To see all recently used Apps so you can switch between them, click the upper left corner. If you can’t seem to find it, you can use the keyboard method of Windows Logo + Tab. To close the app on your screen, you can click at the top middle of your screen and drag down, or use the keyboard method of Alt+F4. The Charms Bar is like mission control. This is where you find the important commands that operate your computer. You can click in the upper OR lower right to open up the Charms Bar, or you can use the keyboard shortcut of the Windows key +C. Share: if you use a smartphone, you may be familiar with this feature. The ability to take something on your screen, a document, a picture, or a map, for example, click the Share Charm and choose a way to share it – via email for example. This only works with Windows 8 specific applications – not with Desktop Apps. Settings: where you turn the power off, reboot or shut down your computer! Volume controls are here as well as Date and Time settings. It is also where you manage all the personalized settings for your computer or an open app. The Desktop is the main computer interface used in all previous versions of Windows. It’s still here in Windows 8, but it’s considered an App in Windows 8. You should see a tile on your Start Screen called “Desktop” – clicking that will take you to a familiar looking screen with a bottom task bar and shortcut icons. You can also use the keyboard shortcut of Windows+D to take you to the Desktop. If you learn to add tiles on your Start Screen for your older programs, you really shouldn’t need to use the Desktop. If you do use the Desktop, It’s important to understand that it is considered one single App to Windows 8. All the programs you may open from the desktop will not show when you use the Task Switcher (Windows-Tab) only the one App called ‘Desktop’ will show, open that and you should see all your currently running Desktop Apps down on the Taskbar as always. We hope you can remember these 5 tips and use them in the order they were written. Start Screen – Make sure all your common tasks have a tile on your start screen. You are always just a click or a key press away. Search – if what you need is not on your Start Screen, you can search for it. From the Start Screen, just start typing. If you’re not on the Start Screen – you know how to get there right? Charms Bar – If what you want to do has to do with overall computer operations, like turning it off or changing the volume, you’ll find it on the Charms Bar in Settings. 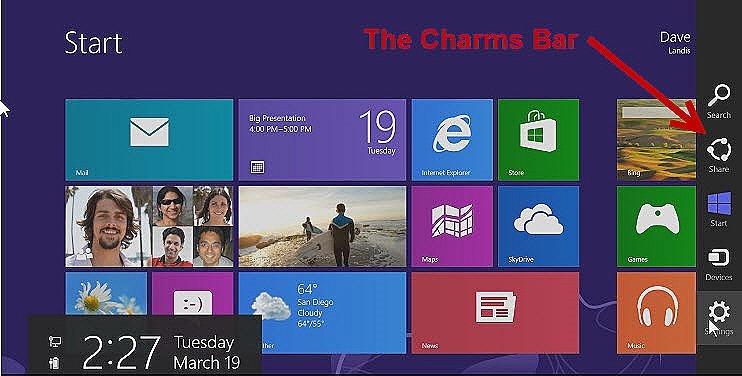 The Missing Windows 8 Instructional Video: A good, 25 minute tutorial video we found on youtube. Published by MrsGeek, in Blog. Tagged with Windows 8 Frustration, Windows 8 tips. i just got into windows 8 with my new laptop. i’m giving it a chance and your summary is very helpful. also thanks for the links.